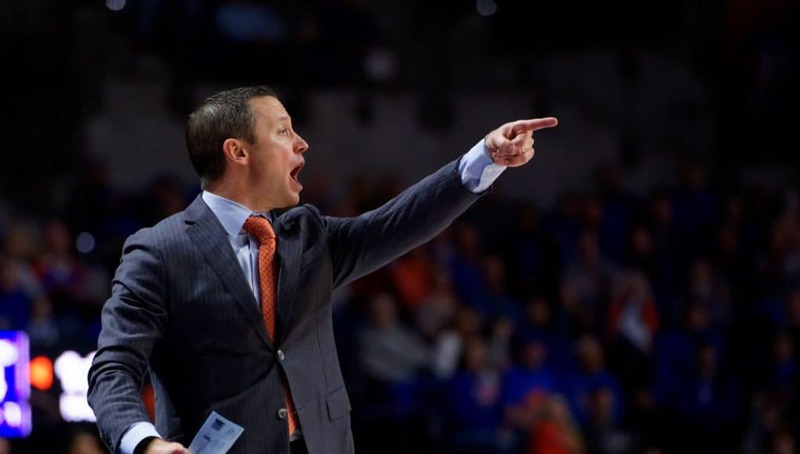 For the fourth consecutive year, the Florida Gators just could not get past the quarterfinal game of the SEC Tournament as they fell to the Arkansas Razorbacks 80-72. Eight consecutive wins over the Razorbacks meant nothing in the late game on Friday night. Arkansas would not be denied. The game actually started slightly leaning in Florida’s favor. The Gators hit five of their first seven attempts from beyond the arc and led by as many as eight early on. The Razorbacks brought it back within three points soon after, but a Keith Stone three pointer gave his team some breathing room. Arkansas then scored the next five points of the game to cut Florida’s lead to 21-20. Stone hit a jumper the following possession, making it a three-point game. A minute later, an Arkansas offensive rebound and tip in brought it back within one. Again, Stone was there to answer as he drained one from deep. Mike Okauru made a three of his own to stretch Florida’s advantage to seven points, but Stone wouldn’t be there to save the day on the Razorbacks’ next run. The Gators did not score a single point in the remaining 4:54 of the half and allowed Arkansas to take a 30-29 lead to the locker room. 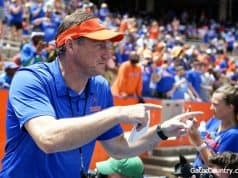 Coming into the game, the Razorbacks had won 39 consecutive times when leading at the half, and Florida wouldn’t be the team to end that streak. After closing out the half on a tough stretch, the Gators just seemed deflated the rest of the way. The two teams went back and forth to start the half. After not getting on the board at all in the first 20 minutes, Jalen Hudson hit a three to go up by two in the first minute. Arkansas and Florida traded three pointers on three straight possessions as the Razorbacks answered Hudson’s three and then KeVaughn Allen followed up with one of his own. Allen’s triple gave the Gators their very last lead of the night, making it 37-35 with 18:13 remaining. While Arkansas didn’t get out too far in front until later on, it felt like it had a pretty tight grip on the game. With 12:02 to go, Stone brought it back to square one again with another made three pointer, tying it up at 46. But a 16-2 Arkansas run over the next seven minutes would essentially seal the deal. 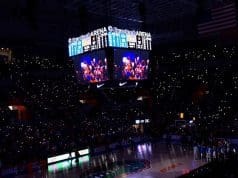 With the Razorbacks leading by 14, Florida would try to make things somewhat interesting in the final minutes, but it was too little, too late at that point. Chris Chiozza got a block on defense, proceeded to grab an offensive rebound off a Hudson miss on the other end and followed through on a three-point play at the 2:18 mark to cut the deficit to eight points. Florida failed to get stops the next two times down the court, putting the Razorbacks back up 69-58. Chiozza chipped away at it again with another layup and 1:08 remaining. Then, Arkansas tried to gift the Gators with a couple more opportunities. A five-second violation on the following inbounds play resulted in a turnover by the Razorbacks. Allen was then fouled on a three-point attempt, but the normally reliable free throw shooter went just 1-for-3 from the line. Chiozza gave the Gators one last shot as he completed another three-point play with 27 seconds on the clock to bring it within seven. Arkansas did what it needed to do at the free throw line, and slammed the door on the game with a huge dunk. The Razorbacks led Florida in nearly every statistical category, but the biggest killers came from the foul line, on the boards and in the paint. Arkansas made more free throws (16-for-24) than the Gators had in total attempts (9-for-14). Florida was dominated 43-28 in rebounding and had no inside presence to compete with the Razorbacks. For the second time this year, the Gators made 13 three pointers against Arkansas, but chips didn’t fall quite the same way. Stone led the effort, going 8-for-10 from the field and 4-for-5 from three for 22 points. Everyone not named Stone combined for a shooting percentage of just 34 percent. Chiozza (16) and Allen (11) also finished in double figures, but that couldn’t make up for the offensive absence of the team’s leading scorer. Hudson had just six points after averaging nearly 23 points per game over the previous three contests. 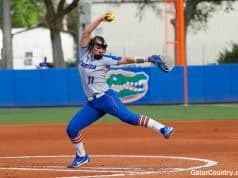 The loss killed the high the Gators were riding on heading into post-season, and now all that’s left to do is sit and wait for Sunday’s NCAA Tournament selection show. Florida is expected to land somewhere in the range of a No. 5-6 seed, but it will need to put on a much better performance than it did on Friday night to have any success in the big dance.